Part No: WP080002 Category: Cartridges for Millipore®. Tags: activated carbon, alternative, anti-scaling, auto-clean, cartridge, depth filtration, elix 20/35/70/100, elix clinical, elix gulfstream, filter, ion exchange, lab water filtration, millipore, pre-treatment cartridge, progard tl1 cl2, progtlcs1, rephile, reverse osmosis, rios 30/50/100/150/200, RR500CPC1. This PR0GTLCS1 Progard TL1 System Cl2 Auto clean Pretreatment Pak alternative cartridge, has been designed to remove most of the large particles, organic compounds and chlorine from tap water to protect the RO membranes. 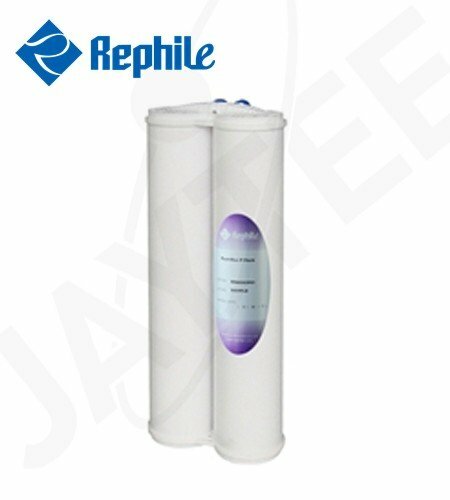 With a special cleaning media, it will clean and sanitize RO membrane automatically. Compatible with Millipore® Elix Clinical, Elix Gulfstream, Elix 20/35/70/100, RiOs 30/50/100/150/200 water purification systems. Technologies employed: Activated carbon, anti-scaling, depth filtration and cleaning media (RO membrane).